10 minutes into the film you get a clear idea why this has a cult following. The incredibly imaginative set pieces and impressive artwork almost fool us into believing that this film isn’t low budget. The indelible images you can’t get out of your head. The title screams “’80s B movie”, but despite the B movie facade, it’s more along the lines of something Tim Burton would come out with. It’s like Pee Wee’s Big Adventure meets The Blob. You go into it expecting it to be so-bad-that-it’s-funny, but instead get a sincerely fun story. And unlike most B movies, you can tell it’s not written by an idiot. The premise is simple. A couple of teenagers discover that giant clowns have landed on Earth and are going around their small town killing people and putting them in cotton candy cocoons. These aren’t the typical human clowns you see in the circus, but large costumed individuals that look like walking puppets. They’re high concept super villains like something out of Batman. They shoot popcorn guns, throw pies made of acid, and make hand shadow puppets that eat people. Practical effects seem to be lost in today’s industry. They bring so much character to older films. If it weren’t for practical effects, Killer Klowns From Outer Space would have gotten lost in the shuffle of all the other CGI showcases. It’s what makes this film unique and memorable–despite the flaws it may have. The film, at times, tends to be carried by these eye-popping visuals and colorful set pieces, as the plot is underwhelmingly routine. It grows nicely and fills the script well, but story-wise just doesn’t quite live up to the curiosity it inspires. Figuring out the motive of the clowns doesn’t pay off as well as you’d hope. At least it gives us likable human characters, even if their personalities don’t progress much past what’s on the surface. But they’re much smarter–and much more well-acted–than average horror movie teenagers. Fortunately, it doesn’t take itself too seriously, and oddly enough it also doesn’t give us too much to laugh at either. But it doesn’t even matter. We almost don’t notice, because the fun mystery of it all is enough for us to be entertained. You wouldn’t think this film would be scary, but with the help of awesome visuals and a killer score, it genuinely sends chills down your spine a number of times. Killer Klowns From Outer Space is a half-baked idea, sure, but it fully delivers. At first glance, this surreal dark comedy may be too weird. However, you have to understand what it’s trying to do. It’s not for everyone, but Heathers is an engaging and honest commentary on how society eats up tragedy, which creates a chain reaction that sends others searching for that same attention. It shows that suicide may not always be an escape from life, but a longing for love and appreciation. While criticizing our culture, it also sympathizes with adolescents who are constantly lost and confused. It poses the food for thought that we vicariously kill each other. The script isn’t perfect, but the narrative is close to it. I love films where you never know where they’re going. And this one is far from predictable. The character study on Veronica (Winona Rider) is fun to watch within itself. She goes from thinking she gets it to actually getting it–and it’s convincing the whole way through. My greatest wish of this film is that the chemistry between Slater and Rider had been better. Much of the time it’s unbelievable and it hinders the effectiveness of their eventual fallout. Like I said, this movie isn’t for everyone. It’s very weird and if you’re looking for a typical black comedy, this isn’t it. This aims a bit higher than just pure entertainment. 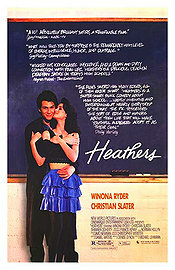 It’s surreality can push it into seemingly inhuman territory, but Heathers is far from it. This is one of those guilty pleasure movies. It’s bad and you’re not sure why you like it–but maybe that means you could call it somewhat good. I dunno. The downfall is in the direction and the script. Many of the scenarios seem ridiculous and odd. Like, how does he go from not knowing what’s in a martini to perfecting the skill of bar tending within what seems to be all of 2 days. But that’s what the norm is in this film–everything is too rushed. It could’ve actually used some more scenes in my opinion–especially towards the beginning–so that we feel as though we are actually on the journey with Tom Cruise’s character, Brian (although most would probably say that it’s 103 minutes too long to begin with). The depth we see in Bryan Brown’s character, Doug, is actually the most intriguing aspect of the script. Other than that, the characters are paper thin. Brian is so hard to tack down that it’s almost annoying, and there’s no background on him at all so it’s not like you can deduce much. None of his actions fall in line with the actions that he makes prior to that and vice-versa. It also doesn’t make much sense why Brian would be best friends with the biggest backstabbing douche in the world (Doug) and value his friendship as much as he does. The acting isn’t bad–just very poorly directed. Cruise smiles at all the wrong times and it makes you want to slap him constantly. Some of his ad libs that they kept in the film are painful as well. Elisabeth Shue has so much potential that if she was paired with even a decent director, she would have shined very bright in this one. This film has a killer soundtrack, fun banter between the characters, and enough one-liners to last me a whole night at my highschool reunion, but the rest of the script that is supposed to be substantial is just laughable. 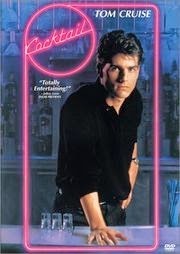 It’s nothing too original as far as the story goes, but with a better script this film could’ve really been something other than just a guilty pleasure and a motivational tape for someone wanting to start his or her own bar. I’m gonna get shot, but I honestly think that it has the potential to be like a Wolf of Wall Street with the result being closer to a Johnny Be Good. Maybe they should remake this film. Nevertheless, I would watch this film again next week.